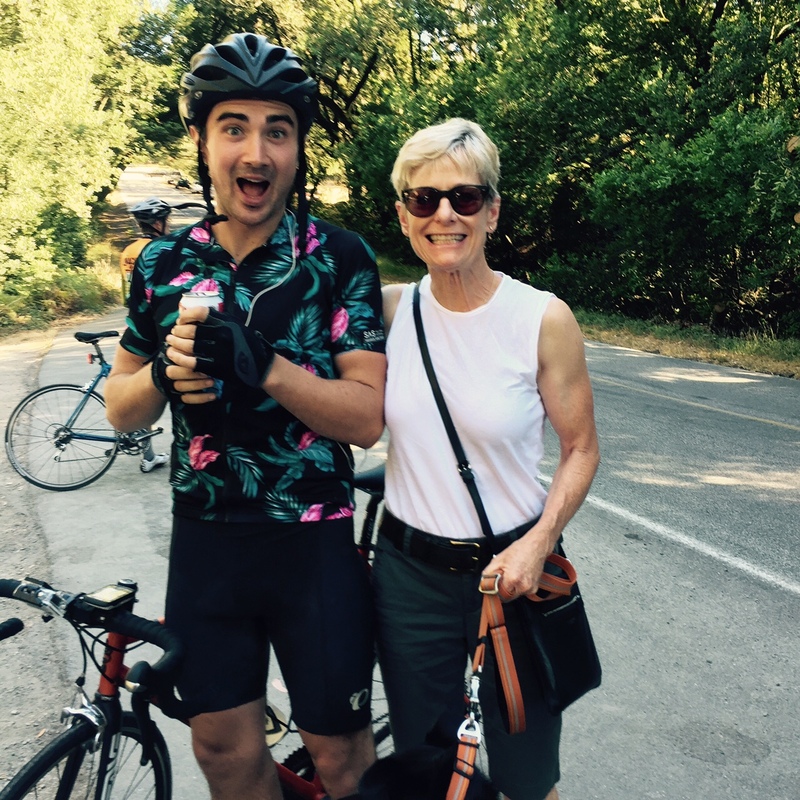 albertnet: New Cycling World Record Set in Berkeley! Remember that “Brady Bunch” episode where Bobby and Cindy tried to set a world record for continuous teeter-tottering? Well even if you don’t, imagine trying to go watch their attempt, as a complete stranger. You’d be chased off by Mr. Brady, or maybe Alice. But today I had a chance to interview a daring world record attempter even while he made his attempt. The current world record—yes, as in Guinness Book of World Records record—for “the most vertical metres cycled in 48 hours” is 28,789 meters (94,452 feet), set in 2012 by a Swiss rider. That’s more than three trips up Mount Everest, if its base elevation were at sea level. The guy out there attempting a new world record, even as I type, is named Craig Cannon. In addition to wanting to set a new record, he’s hoping to accumulate 100,000 vertical feet. 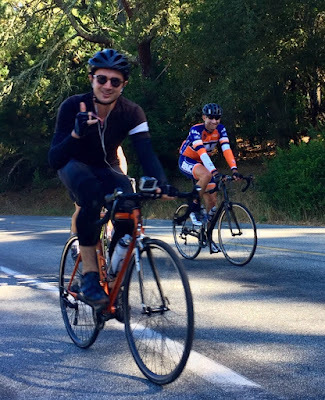 Something I’m particularly excited about is that Craig is doing this via endless trips up my favorite climb, South Park Drive in the Berkeley hills. (I love this climb so much, I wrote an Ode to it, replete with footnotes & commentary, which you can read here.) But as difficult as this climb is, Craig is doing his laps on the hardest section, which is 1.1 km (0.68 miles) long, at an average grade of 12%. The elevation difference between the top and bottom of this section is 129 meters (423 feet). So he’ll need to have completed about 236 laps (about 321 miles) in 48 hours. You can see the Strava segment by clicking here. 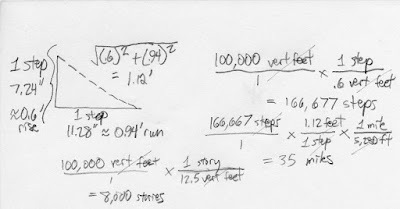 So how much is 100,000 vertical feet? Let’s put it in perspective. A staircase gaining that much elevation would be 35 miles long; would have 166,667 steps; and would take you to the top of an 8,000 story building! Wait. Stop. Set aside, for a second, the math and the grade and even the 100,000 feet. Just think about bicycling up and down a murderously steep grade for 48 hours straight. It’s an unbelievably difficult challenge Craig has undertaken. Until this past Thursday, I’d never heard of Craig or this effort. 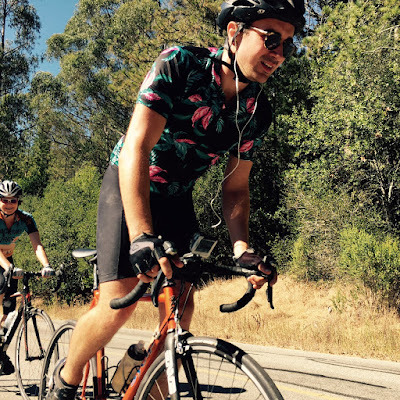 What I can tell you is that he’s an Oakland area cyclist, a member of the Knackered Tyres cycling club, and has ridden with my East Bay Velo Club teammates a few times. He asked one of them, Mike, to get the word out about his effort. Craig wanted to have as much company as possible on the road, for moral support. 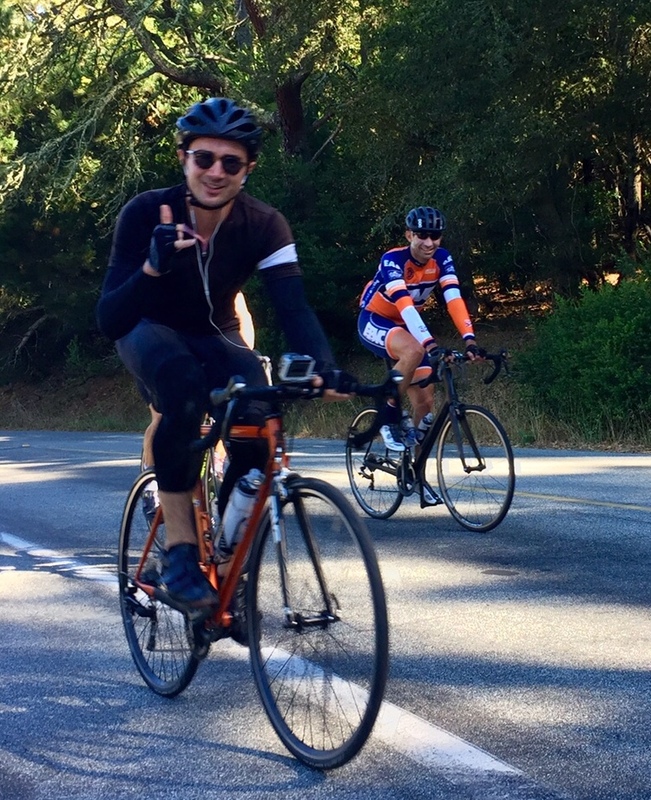 The only other thing I’d heard, before meeting up with him on the road, is that he started a little after 5:00 p.m. on Friday, rode through the night, and was joined by a couple of my teammates at around 11:30 a.m. on Saturday. Here he is—he’s the guy in all black—riding with Muzzy (white arm warmers) and Jamey (behind him). So this is 18½ hours into his effort. And here he is at 9:48 p.m. on Saturday, close to 29 hours in. My teammate MB snapped that photo; she and Muzzy, her husband, had gone to check on him that night (but without bikes). No good action shots due to the darkness, of course. That’s Craig’s mom, by the way, with the headlight. The next morning MB, Muzzy, and another teammate, Lucas, joined Craig for some more pacing. This photo is from about 9:50 a.m. when he was about 41 hours in. Still looking pretty chipper, eh? I thought about leaving for my own ride extra early this morning to ride a lap or two with Craig on the way to meeting another teammate, but I just didn’t feel like getting up that early, even to witness history being made. I figured I’d drop in on the action on my way back from Mount Diablo. Now, the easy way to come home from Diablo is via Wildcat Canyon Road, which links right up with South Park. But to be honest, I was afraid that if I took this route, I’d chicken out, tell myself some lie like “He’s surely given up,” and go straight home. I mean, cycling is hard, and attempting even one out-of-the-way trip up South Park presents a serious “gumption trap” (to borrow a term from Zen & the Art of Motorcycle Maintenance). So I came home over Lomas Cantadas, so I could descend South Park and look for Craig. I have to admit, the small, weak part of me wouldn’t have been too disappointed if he’d given up, because I really, really didn’t feel like riding up South Park, even once. 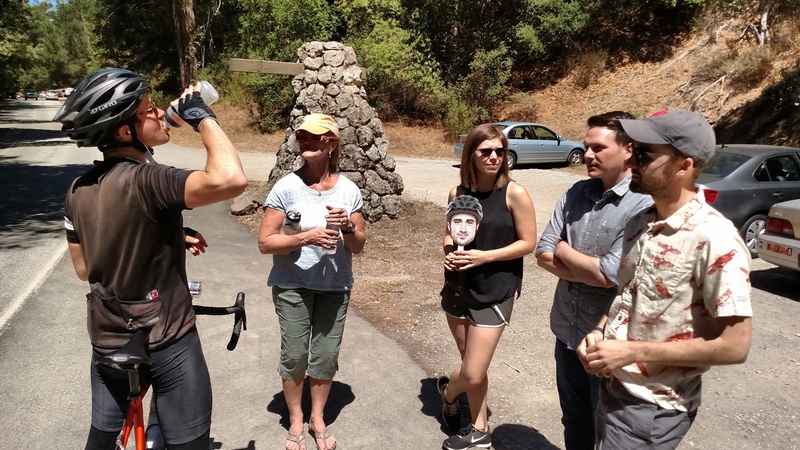 And frankly, even though Craig had invited us to ride alongside him, I wasn’t at all sure I’d actually be welcome. I mean, it was close to noon, meaning this guy had been riding for 43 fricking hours straight. If I get less than 7 or 8 hours of sleep, I’m pretty grouchy. I’ve pulled one all-nighter in my life, and was a beast afterward. And that didn’t even involve continuous cycling on a brutal grade. I feared that, by this point, Craig might be in no mood to deal with anybody, least of all a chatty guy like me. Plus, not having seen the Sunday morning photo shown above, I figured Craig would look like absolute hell, presenting a truly pitiful sight. So though I hate to admit it, I was prepared to be (one one level) kind of relieved if he wasn’t there. But then there he was, cranking his way up the road, flanked by my teammate, MB. By the time I safely turned around to catch up with them, they were pretty far ahead. I had to really work to close the gap. What the hell? I’d ridden, what, 5 hours? Amazingly, even after 43 hours, he was putting out a good pace. After a short introduction whereby I invited him to tell me to shut up and/or go away if I bothered him—because I totally understood the pain cave where you want to suffer in peace—we had a nice chat over three laps (1,269 vertical feet) of the climb. So, how was he doing? Just fine! Still on target! 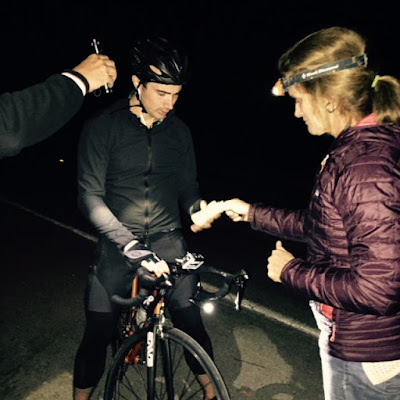 With about 5 hours to go, he’d tallied up about 90,000 feet of vertical gain. So he had to average 2,000 feet per hour for the rest of his ride to make his goal (half that to break the current record), and we were doing about 2,500 as we rode. (To put this in perspective, the Tour de France peloton does around 4,200 feet per hour during the mountain stages.) Craig had been through a pretty difficult period but had come through it. He’d taken about a 25-minute rest during the night, but couldn’t tell if he’d actually slept or not. He really did look relaxed and strong. Here are a couple of photos, taken a little before noon. Does he race? No, he just likes “messing around on a bike,” as he put it. (I’m quoting him as though verbatim but it’s just from memory. To do otherwise is just too clunky.) He hasn’t ruled out racing in the future. He did do a pretty gnarly competitive event that had the word “Everest” in it. 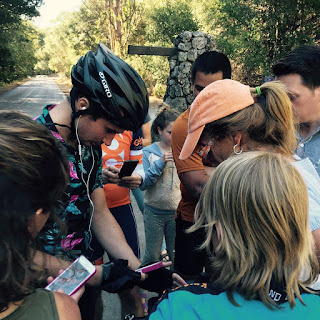 It wasn’t the Everest Challenge, a race I’ve done and written about a few times, which features 29,000 feet of climbing over two days, but rather a self-paced, virtualized GPS-based event where you try to accumulate that much vertical gain in just one ride. Craig accomplished that on this very climb—South Park Drive—though he was doing longer laps, from the very bottom to the top. So, why South Park Drive? He worked with a coach and thought hard about the best way to tackle this world record, and ultimately decided this climb was perfect because it was steep enough that his speed would be low enough (too shallow a grade = too much speed = excessive wind resistance); the grade wasn’t so steep that his pedaling cadence would get too slow; and this road has a lot of cyclists on it so he’d have plenty of moral support. He emphasized the need for camaraderie since so much of such an effort is psychological. Oh, and he needed a route that has restrooms. And an extra bonus is that when you descend this road, there aren’t any roads connecting to it from the right. This makes it a lot safer. Tons of food? Yes, though most of the calories are from energy drink (I think he said this, and no, I didn’t manage to remember what brand he uses). Beyond that he eats a total hodgepodge of things, including potato chunks with olive oil and salt. Caffeine? Yes, plenty, and he went off it completely for two weeks prior to lower his tolerance. He also stopped having any alcohol for like six weeks leading up to the record attempt. Longest ride before this? Low 40s. As in, more than 40 hours. Unbelievable. He’d also done a 48-hour double-all-nighter (not on the bike) just to make sure he could do it, and then immediately rode up Mount Diablo. As we chatted, I couldn’t get over how chipper and good-natured he was, and how solid a pace we were knocking out. Occasionally on a particularly steep pitch he’d stop mid-sentence and say, “Can’t talk now.” Then he’d pick right back up again later. In addition to Knackered Tyre teammates joining him on the road (in shifts, like my EBVC pals were doing), Craig had a team based at the bottom of his route, at the turnaround point. His mom, who had flown out from Boston to support him, was there for the entire duration of his effort and stayed awake the entire time! A woman whom I believe is his girlfriend had put an image of him on a stick. I’m not entirely sure what this was used for, but I like it! It’s 5:02 p.m. I think he said he started at 5:10 p.m. (last fricking Friday, for crying out loud!) so he might already have the record ... and he might already have crossed that miraculous 100,000-feet threshold! It was fun getting Craig’s story even as he lived it, and part of me wanted to ride with him the rest of the time, but a) the part of me that wanted to keep going was only the mental part, whereas my body had had quite enough, thank you; b) I was out of energy drink and gels and wasn’t about to bum some off him; and c) I was sure he’d get sick of me. (I would.) So I rolled home at around 12:20 p.m., thinking how cool it would be to rest a bit, have some food, and then return to join him for those last few victorious laps. But in my heart I knew I wouldn’t make the effort. Bicycling up hills is really hard and we’re not, any of us, made of such stuff as Craig obviously is. Well?! Did he make it?! And here he is checking his GPS device. I can well imagine it would be difficult to interpret (much less believe) the instrument’s data after 48 hours of cycling. Good thing he has other people corroborating. (There was also the (perhaps not wholly unwarranted) fear of the device malfunctioning and losing his record-breaking data, so several pals snapped photos of it.) His total elevation gain was 95,622 feet ... more than enough to set a new world record, though a bit short of his (albeit arbitrary) goal of 100,000. Kind of like hitting a grand slam home run but not sending the ball into low Earth orbit like you thought might be cool to do. And here he is with MB enjoying a cold post-ride beverage. I’m told NBC News showed up at the end to cover the victory celebration. Way to go, Craig! Assuming default configuration of your Internet browser and computer operating system, this blog post will be set in Georgia, a typeface originally cut with a crude hunting knife into the trunk of a Mongolian oak (quercus mongolica) in Izborsk, Russia, in the early 1800s by Ivan Ivanovich Zakareishvili in memory of Tsar Alexandar I. Georgia was first introduced to the web in 1997 when bundled with the Internet Explorer 4.0 supplemental font pack. Thanks for this report. I heard about this and found it incredible. It's great to read he made it! What an incredible project. Chapeau! Awesome post Dana! You kept a great pace + conversation during the ride. Thanks! Craig, I'm glad you liked the story! What an amazing Strava profile & stats. I realized when looking at it that I forgot to count your downhills in the mileage total in my report, so I was way off there (duh!). I've fixed that. It was so fun riding with you as you made history. See you on the road! wow! love the backyard adventure taking down a world record, inspiring!! Hi Dana - Great story. Good to see that you are still riding and writing. Wow, it's cool to hear from you! I think the last time I saw you was at college graduation ... right? That is probably right. I remember you trying to figure out how to phonetically spell out "Dana Albert" to write on the card for the person that would be reading your name. Are you on Facebook or are you a conscientious objector?